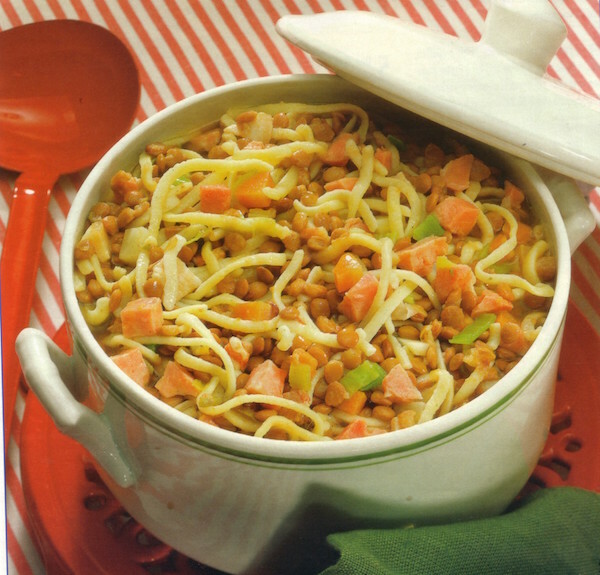 The German Lentil stew with Spaetzle is a popular Swabian dish that is served in almost every Swabian "Gasthaus or Gasthof" (Gasthaus is a Inn with local specialties and home cooking such as "Gasthaus Krone" or "Gasthof Baeren" ). You can make the Spaetzle or get them dried from the German manufacturer Bechtle, they have really good Spaetzle. In case you don't know what Spaetzle are: Spaetzle are a sort of pasta, some call them dumplings but they are special noodles used as side dish, in soups or stews such as the German lentil stew. Happy Cooking! 1. Soak the lentils for at least 6 hours or overnight in cold water. Drain them, wash under running water, let drip. 2. Slice carrots, leek and celery stems, cut celery root in cubes. Cut Speck in cubes. chop onions. Saute bacon with onions, carrots, leek and celery in the oil for 1-2 min. 3. Add 1 l water, lentils and instant broth (or the broth), bring to a brisk boil. 4. Spice the stew with mustard, spices and vinegar. Let simmer for 1 hour or until lentils are very soft. 5. 7-8 minutes before the lentils are done, add the dried Spaetzle. Cook them with lentils until they are soft. If you make Spaetzle from scratch cooking time is reduced to 2-3 min. 6. Cut Kassler or sausages in slices or cubes. Add to the stew for some minutes before you serve it. Sprinkle chopped parsley over the stew before you serve it.